This would place it sometime before 164 B.C.E. Dates for the earliest portions have ranged from sometime in the 300's B.C.E. to 200 B.C.E. The book of Enoch (I Enoch) belongs to a collection of writings known as the Apocalyptic Literature. According to sacred-texts.com , the Apocalyptic Literature surfaced extensively in the years between 200 and 150 B.C.E. Click on the links below to go directly to that section of The Book of Enoch. View comments & post yours! This period stretched approximately 300 years, and included what came to be known as the Apocalyptic Movement, coming to an end around 100 C.E. (AD). The Book of Enoch has come to be known as I Enoch. These are the earliest portions of the larger book, and include the first 36 chapters. These chapters deal with the Watchers, those angles responsible for the Nephilim. The Secrets of Enoch have been labeled as II Enoch, to differentiate between the two, and was composed at a later date. The authorship of the book of Enoch the prophet has been in debate as well. F.C. Burkitt has studied the subject extensively, and claims the earliest portions of the book were written by a Jew who lived in the land of Dan, in northern Palestine. The various dates assigned to the different chapters of the book of Enoch attest to the multiplicity of its authors, according to the popular theory amongst scholars. The original language the book was written in has raised many questions as well. The book of Enoch currently exists only in the Ethiopic version. This version was rendered from the Greek, which only a few portions have survived. The Latin version of the book of Enoch was also translated from the Greek, however, this version is no longer in existence. Scholars are not certain exactly which language the original was written in. That the Greek version was translated from a Semitic source is considered fact. However, what that Semitic language was is not known. The majority of opinions lean towards Hebrew and Aramaic, yet, which was the original is uncertain. Burkit suggests the majority was originally in Aramaic, but a few passages suggest an ancient Hebrew origin . Aramaic and Hebrew were just two dialects amongst many belonging to a branch of languages believed to be of Northwest Semitic origin. Other languages from this branch include the Canaanite and Phoenician languages. Aramaic was the day to day language of ancient Israel during the Second Temple Period, which dates from 539 B.C.E. to 70 C.E. The majority of Daniel and Ezra were written in Aramaic. Thus, the book of Enoch undoubtedly stems from ancient origins. The book of Enoch, for the most part, was lost after the fifth century AD. It is widely agreed Saint John Cassian was the last of the early Church Fathers to quote extensively from Enoch. After he died in 435 A.D., the text only appeared in brief references from the 8th and 9th centuries A.D. The book was thus thought to have been lost. However, the book of Enoch resurfaced at the beginning of the 17th century when it was discovered in Ethiopia, written in an Ethiopic language. In fact, the book of Enoch is preserved in it's entirety in the Church at Ethiopia, and is included in their Bible. The Ethiopians claim it was divine scripture, and treat it as such to this day. Scholarship of the book increased in the early 1900's through the work of R.H. Charles, considered to be one of the chief authorities on the book of the modern era. He was able to expound on earlier translations due to the discovery of ten additional texts. In 1906, Charles published his work using all resources available to him, as well as 23 Ethiopic manuscripts. In the early 1950's, copies of the book of Enoch were found in the Dead Sea Caves, amongst the Dead Sea Scrolls. 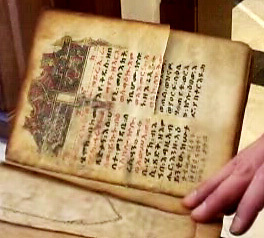 This lent credence to the antiquity of the book, and provided copies of original text written in Aramaic. The Ethiopic Orthodox Church believes the Book of Enoch in their Bible is the original text. They also consider the book to have been written by Enoch. As Enoch was the first man ever to write letters, the Ethiopian Church believes the opening verses of the book of Enoch were the first words in history to have been written. "The Word of blessing of Henok, wherewith he blessed the chosen and righteous who would be alive in the day of tribulation for the removal of all wrongdoers and backsliders." It is quite amazing that perhaps the first words ever written dealt with the end times! It is even more amazing if one is of the school of thought we are living in those last days. If one ascribes to that theory, then Enoch was speaking to this generation, thousands and thousands of years prior! Perhaps it is no coincidence the Book of Enoch has reappeared in this modern era. Readers rave about Dr. Timothy J. Sakach and his commentary on the book of Enoch entitled Enoch: The Book Behind the Bible. Click on the link below to visit Amazon.com. The Book of Enoch paints a picture of cosmic warfare, one in which the principals of darkness are battling the men of earth. The men of earth become enchanted with these fallen angels, and the knowledge these angels introduce them to. However, these "children of heaven" forcibly enslaved mankind, treating him brutally and cruelly. They also impregnated the "daughters of man", and created offspring of mysterious beings the book of Genesis calls, "the Nephilim". The full story, according to the book of Enoch, is as follows. Enoch opens up his book in Chapter 1 with the understanding it is not intended for the people of his day. Verse two makes it clear that the following is not "for this generation", but for a "remote one which is for to come". This eliminates the possibility Enoch was talking about the generations leading up to the flood. Those were not remote generations, as Enoch was the great-grandfather of Noah , based on the Scripture in Genesis. It is not unlikely to assume Enoch may have been alive for a short part of Noah's life.
" 4. And the eternal God will tread upon the earth, (even) on Mount Sinai, And appear from His camp, And appear in the strength of His might from the heaven of heavens. 5. And all shall be smitten with fear And the Watchers shall quake, And great fear and trembling shall seize them unto the ends of the earth." For the first time we are introduced to the "Watchers". The identity of the Watchers is revealed later in the text, as will be seen. These were the fathers of the Nephilim. The Watchers were the angles God had placed in the heavens of earth to watch over mankind, and see to his well being. Amongst these Watchers, according to the book of Enoch, was Michael the archangel, as well as Uriel, Gabriel, and Raphael. The presence of Michael in the earthly heavens correlates remarkably to the many appearances he makes on earth in the Bible. Enoch continues in chapter one with a passage that could just as easily be found in the book of Revelation. "7. And the earth shall be wholly rent in sunder, And all that is upon the earth shall perish, And there shall be a judgment upon all (men). 8. But with the righteous He will make peace. And will protect the elect, And mercy shall be upon them. And they shall all belong to God, And they shall be prospered, And they shall all be blessed. And He will help them all, And light shall appear unto them, And He will make peace with them. 9. And behold! He cometh with ten thousands of His holy ones To execute judgment upon all, And to destroy all the ungodly: And to convict all flesh Of all the works of their ungodliness which they have ungodly committed..."
Enoch speaks of the end times in this passage, when God will come down to execute His righteous judgment, and establish His kingdom on earth. The Book of Enoch differentiates between the righteous, who will be protected, helped, and who belong to God, as opposed to the unrighteous, who shall perish by the works of their own unrighteousness. 1. This book is meant for a "remote" generation 2. The Watchers will "quake" at God's presence 3. God is coming in judgment of all 4. The righteous will be spared, but the unrighteous shall perish. Chapter 2 is a passage almost identical to the one in Jude, discussed earlier. In it, Enoch explains that God has set everything in the order He wished it to be in. This order is set, defined, and not to be disrupted. It was God's wisdom which placed things in their proper place, and any wisdom deeming otherwise is ungodly, and evil. "1. Observe ye everything that takes place in the heaven, how they do not change their orbits, and the luminaries which are in the heaven, how they all rise and set in order each in its season, and transgress not against their appointed order. 2. Behold ye the earth, and give heed to the things which take place upon it from first to last, how steadfast they are, how none of the things upon earth change, but all the works of God appear ?to you?. 3. Behold the summer and the winter, ? ?how the whole earth is filled with water, and clouds and dew and rain lie upon it." The Book of Enoch is setting up the Nephilim situation, and what made that outcome so detestable in the eyes of God. Chapters 3 and 4 are brief passages, reaffirming God's original intent. Enoch explains the works of summer and winter, and the effect they have upon the trees. His point is that God has set things in motion with intent and purpose. In I Enoch 5:4, Enoch established the Watchers guilt. "4. But ye--ye have not been steadfast, nor done the commandments of the Lord, But ye have turned away and spoken proud and hard words With your impure mouths against His greatness. Oh, ye hard-hearted, ye shall find no peace. 5. Therefore shall ye execrate your days, And the years of your life shall perish, And the years of your destruction shall be multiplied in eternal execration, And ye shall find no mercy." Chapter 6 gets into the specifics regarding the Watcher's transgression, and that of their Nephilim children. "1. And it came to pass when the children of men had multiplied that in those days were born unto them beautiful and comely daughters. 2. And the angels, the children of the heaven, saw and lusted after them, and said to one another: 'Come, let us choose us wives from among the children of men and beget us children.' 3. And Semjâzâ, who was their leader, said unto them: 'I fear ye will not indeed agree to do this deed, and I alone shall have to pay the penalty of a great sin.' "
Enoch leaves no doubt he is referring to angels. It is worth noting these angels were termed "children of the heaven". Their proper place of abode was in the heaven above earth. It becomes evident in the book of Enoch that Enoch saw the heaven of the earth as a separate place than the Heaven of God. Thus, the Watchers were to watch man from above the earth, and ensure his safety and well being. Yet, they looked down upon the earth, and became infatuated with the daughters of men. These angels explicitly made it clear they sought to reproduce with these women, and to generate children. The Book of Job makes it clear Satan dwelt on the earth. He tells God he has come from "roaming about on the earth". Perhaps it was during one of his "trips" which he brought to the attention of these angels the loveliness of earth's women. It is clear they sought to establish children, thus, Satan's plan to thwart the "promised seed of the woman" appeared, in his eyes, to be on the verge of success. The Nephilim would be his divine instruments of evil for generations to come. This passage also introduces the key figure, Semjaza. Semjaza is the same angel tabbed by the ancient rabbis as Shamhazai, from the passage above. Semjaza, thus, was the grandson of the two brother kings, Og and Sihon, discussed above as well. Og and Sihon's power can be attributed to their grandfather, who was leader of all the fallen Watchers. Og and Sihon, in turn, were actual Nephilim. Semjaza makes it clear the angels knew they were in direct violation of God's will. He even calls their plan of action a "great sin". Semjaza, however, is more concerned he will be the only participant, and he alone will have to pay the penalty. Satan, the chief architect of the first rebellion, had obviously influenced these angels to partake in a second rebellion, even though these Watchers knew their actions were damning. Perhaps Satan thought heaven too much of a home field advantage for God, as he had been soundly whipped before. Thus, the ever creative genius of evil decides to take his battle to the earth, away from the eyes of God, so he thought. In order to do so, he had to persuade some angels to once again follow him. Instead of tempting them with promises of power, he takes the route of sexual temptation. The daughters of men provided just such bait. Augustine perhaps found his precedent for describing angels as possessing the, "passions of man", due to this instance. When viewed against this backdrop, the words of Satan to Jesus during His temptation in the desert are extremely revealing. In Luke 4:6, Satan tempts Jesus with authority over the earth. "And the Devil said to Him, ' I will give You all this domain and its glory; for it has been given to me, and I give it to whomever I wish." What a fascinating statement by Satan! In his original state as the chief amongst the angels, God had given him the earth as his domain. Satan became greedy, and wanted more, thus his failed attempt at the throne of God. However, in an effort to establish his own kingdom, Satan enticed these Watchers to descend from above. They produced Nephilim children, and Satan imputed them with all authority and power over earth! Verses 4-6 divulge their plan of action. The book of Enoch even mentions where the angels originally touched down upon the earth, and lists the time of their arrival!
" 4. And they all answered him and said: 'Let us all swear an oath, and all bind ourselves by mutual imprecations not to abandon this plan but to do this thing.' 5. Then sware they all together and bound themselves by mutual imprecations upon it. 6. 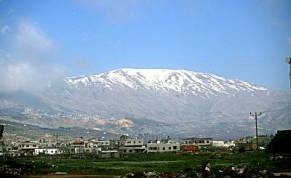 And they were in all two hundred; who descended in the days of Jared on the summit of Mount Hermon, and they called it Mount Hermon, because they had sworn and bound themselves by mutual imprecations upon it. 7. And these are the names of their leaders: Sêmîazâz, their leader, Arâkîba, Râmêêl, Kôkabîêl, Tâmîêl, Râmîêl, Dânêl, Êzêqêêl, Barâqîjâl, Asâêl, Armârôs, Batârêl, Anânêl, Zaqîêl, Samsâpêêl, Satarêl, Tûrêl, Jômjâêl, Sariêl. 8. These are their chiefs of tens." Enoch states the angels swore to each other they would collectively descend to earth. He numbers them at 200, and places their descent on the peak of Mt. Hermon! Enoch even gives the reason for the name of Mt. Hermon; "because they had sworn and bound themselves by mutual imprecations (curses) upon it". Remarkably, Mt. 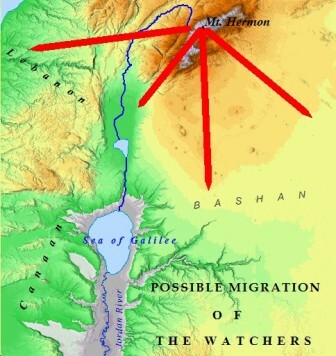 Hermon is a mere 43 miles from Ashtaroth! Ashtaroth, if remembered from above, was the capital of King Og of Bashan, the supposed grandson of Semjaza. Whether this is the same Mt. Hermon of the post-flood world may or may not be the case, as geography was surely radically altered by the flood's raging waters. However, the Mt. Herman of the post-flood world suggests this was indeed the same as it was before the flood. The kingdoms of the post-flood Nephilim seem to follow a southward route of migration stemming from Mt. Herman. 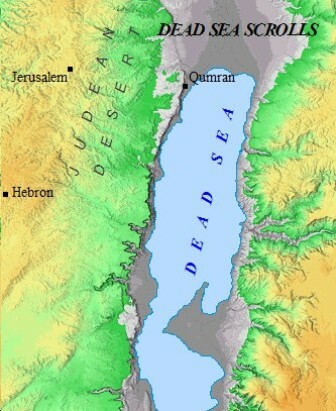 Bashan would have been the first land encountered after descending the slopes southward. It must be kept in mind that normal modes of transportation did not apply to these beings. Presumably, they could cover great distances in very short amounts of time. Further evidence in Enoch pertaining to the land of Dan suggest this was indeed the same Mt. Herman. The book of Enoch places their arrival on earth during the days of Jared, Enoch's father. Thus, he makes it clear the Nephilim were on the earth a significant time prior to Noah! Jared was said to have lived 963 years. Enoch does not specify exactly when during the days of Jared they arrived. If they arrived in the early years of Jared, then it follows their presence on earth could have lasted over a thousand years, leading up to the days of Noah! This was more than enough time to fully integrate themselves into human society. By the days of Noah, then, the earth was completely overwhelmed by these giant Nephilim. All of man had been enslaved over the previous centuries, as the Nephilim had surely populated the entire earth, extending to all four corners of the globe. The grand sweeping influence of the Watchers and their Nephilim children, which had gone uncurtailed for perhaps more than a thousand years, provides a background for the gravity of God's statement in Genesis 6:5. "Then the Lord saw that the wickedness of man was great on the earth, and that every intent of the thoughts of his heart was only evil continually." The ramifications of this are staggering. Could it be the unexplainable technology and achievements of the ancient Mayans, Egyptians, Sumerians, and other civilizations find their roots in the teachings of the Nephilim? The book of Enoch attributes the technology of the ancients to the teachings of the Watchers in the following chapters. Share Your Thoughts On Enoch & the Nephilim! Are you a student of Enoch the prophet? What is your explanation for the passage in Genesis? Click on the above link to give us your insight, thoughts, comments, and questions! Enoch describes the depth of the depravity and corruption of the Nephilim upon the earth in Chapter 7. "1. And all the others together with them took unto themselves wives, and each chose for himself one, and they began to go in unto them and to defile themselves with them, and they taught them charms and enchantments, and the cutting of roots, and made them acquainted with plants. 2. And they became pregnant, and they bare great giants, whose height was three thousand ells: 3. Who consumed all the acquisitions of men. And when men could no longer sustain them, 4. the giants turned against them and devoured mankind. 5. And they began to sin against birds, and beasts, and reptiles, and fish, and to devour one another's flesh, and drink the blood. 6. Then the earth laid accusation against the lawless ones." The Watchers were thus responsible for teaching mankind the divine secrets given to them by God. As God gave these secrets to His angels only, they were not intended for mankind. 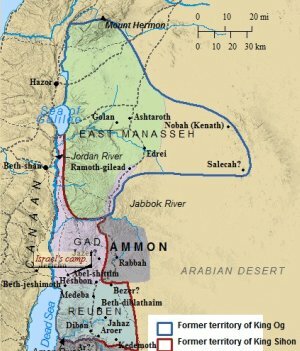 This was the beginnings of the religious system which Israel fought so fiercely against throughout its early existence as a nation. The Babylonian and Canaanite religious practices were an evolution over time of these original instructions. It would follow that the gods of these religions, then, may have been based on the Nephilim upon the earth in those most ancient of days! This is the reason why God dealt so harshly with the Canaanites, and other enemies of Israel. The remnant of these original Watchers and Nephilim had to be done away with totally and completely. Not only did the Watchers defile man, but the book of Enoch relates they turned against the animals of the earth as well. They sought to totally annihilate any and all of God's creatures. They resorted to devouring flesh, and drinking blood. The book of Enoch closes by terming these angels as the "lawless ones". This term in and of itself does not raise any eyebrows. "And then that lawless one will be revealed, whom the Lord will slay with the breath of His mouth and bring to an end by the appearance of His coming." It would seem Paul was quite familiar with the Book of Enoch, describing the evil of the anti-christ in the same terms Enoch used to describe the evil of the Watchers. Paul seemed to echo the ideas of Enoch is some of his other writings as well. Indeed, times will be similar to Enoch's in regards to the wickedness found upon the earth in the last days. The book of Enoch concludes chapter 7, with the earth laying its accusations against the lawless ones. Click on the link to continue to the Book of Enoch part 2 of 3. Had you encountered the book of Enoch before? Are you a student of Enoch? Do you have insight into the Watchers? What are your questions concerning Enoch? Share your thoughts, comments, insight, and questions on the book of Enoch here! Do you have a picture to add? Great! Click the button and find it on your computer. Then select it. All pictures and images must be in .jpg or .gif format. You mentioned only 19 watchers. If 200 descended, and these were the chiefs of tens, then there is one missing. Am I correct? Last Days Related to the Book of Enoch.